These Open Educational Resources (OER) are designed to apply key enterprise and entrepreneurship concepts to real life UK and Chinese enterprises. For each enterprise case study, there is a video case study compiled from company visits and interviews, a company profile and some suggested underpinning teaching materials. The teaching materials are designed to develop both enterprising and entrepreneurial skills to support employability and future potential entrepreneurship. The enterprises selected for the teaching material include both recent start-ups and more established enterprises which are involved across a range of industries from retail to high tech research and development enterprises. The teaching materials are Open Educational Resources and can be adapted and developed to meet the needs of your teaching. Several of the case studies provided overlap in their content, for example in subject areas such as innovation and business models, and can be used in combination as required. In these cases several videos and sets of material can be selected and can be used, for example, to demonstrate some of the similarities and differences between the Chinese and UK enterprises and between different industries. We hope that you find the teaching materials helpful in your practice and we would welcome your comments and discussion and would be interested to hear how you have applied them in your teaching. The materials were up to date as of when they were filmed and collated; however, they might not reflect the current situations of the featured businesses. 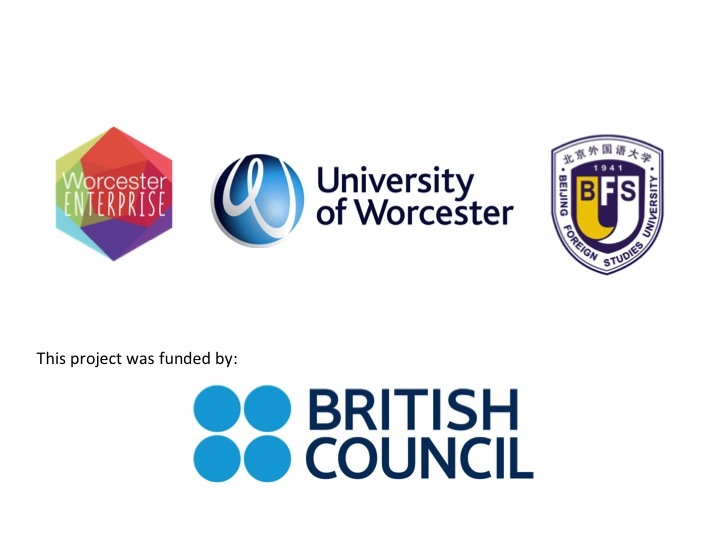 This project was kindly supported by the British Council’s UK-China Enhancing Graduate Employability and Entrepreneurship Fund and was undertaken by teams from the Beijing Foreign Studies University, PRC and the University of Worcester, UK and was led by Dr Robin Bell. These are Open Educational Resources and therefore freely accessible and openly licensed documents. Learning Material Business Models Case Study, Business Planning Case Study, Business Plans & Business Models Case Study, Corporate Entrepreneurship Case Study, enterprise, Entrepreneur Case Study, Entrepreneurial Team Roles Case Study, Entrepreneurship, Entrepreneurship Core Skills Case Study, Finance Case Study, Innovation Case Study, Market Research Case Study, Open Educational Resources, Resources & Capabilities Case Study, Startup Case Study, worcester business school. permalink.